Not only do I like reading, but I enjoy reading about reading. My bookshelves provide plenty of evidence, as do my file cabinets. Whenever I have my students working on a research topic, I model with one of my own. My favorite topic to study is the value of reading. I confess that I don't enter the research with a blank slate, wondering whether or not reading really is valuable. I know it it. I just want others' research to confirm and support what I already know. I've found plenty of research that shows that reading literary fiction has more positive effects on the brain than any other kind of reading--even if one doesn't enjoy it. The research on the connection between reading and empathy is equally powerful. I've long told students in my literature classes that books can take them places they might never visit--the jungles Africa or frigid Antarctica, but even if they are adventurous enough to reach those parts of the world, only in a book can they travel to Renaissance Italy or to London during the blitzkrieg of World War II. 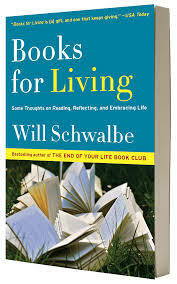 An article entitled "The Need to Read" popped up in my feed today from the Wall Street Journal by Will Schwalbe, who wrote The End of Life Book Club, about shared reading with his mother during her chemotherapy treatments. He has written other books about books, and what he has to say resonates with me. I think it will give you food for thought too. A bonus is that this piece also serves as a book list, you can check off the ones you've read (and loved) and add to your to-read stack. I find it amazing that biographer Walter Isaacson could write a 1100-page book (at least it's that long as an eBook) that tells me so much about an artist I think I knew. What I knew already barely scratched the surface of this true Renaissance Man. Isaacson did extensive research of the previous biographies of Leonardo, but some of the best details come from the abundance resource of the notebooks left behind. While he followed the great man's life chronologically, from his birthplace to Florence, then Milan, then back to Florence before eventually moving to France, he filled out the story not only with what Leonardo was doing or creating, but what he was thinking. Perhaps the biggest charm of the notebooks is the randomness, the seeming lack of connection between items on the page. Yet, right there on the page where he explored the many muscles controlling the mouth, we find an early glimpse of what may be Mona Lisa's smile. Thanks to popular culture (and Dan Brown), many of us know about Mona Lisa, the Last Supper, and the Virgin on the Rocks. What we may not know about are all unfinished works of his career. He turned down what would have been lucrative commissions and left other potential masterpieces unfinished. Even more amazing, I learned, he made discoveries that remained on his pages, waiting for others to discover them, sometimes centuries later. He was one of the first to understand the way the aortic valve closed, for instance. And while we know about his Vetruvian Man and his drawing of flying machines, we know less about his wide range of interest is diverting water or studying the flight of the dragonfly. Let the perfect be the enemy of the good. Then in the coda, he brings readers back to one of Leonardo's notes to himself: Describe the tongue of the woodpecker. In two paragraphs, Isaacson shares the result of the description. It was worth waiting for. For someone who claims to prefer fiction (and I do), I seem to read a lot of nonfiction. 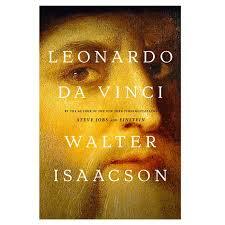 In fact, I've started the year halfway through the 1100-page biography of Leonardo da Vinci by Walter Isaacson. Here are some of my favorites from this year. One of the best readings I attended at Parnassus Books this year featured Peter Cooper, singer-songwriter and former Nashville Tennesseean music writer. The book, aside from its clever title, is full of stories from Music City, not only about the most famous characters--Johnny Cash and even Taylor Swift, but others known more by insiders, including the owners of Station Inn. My only regret is that I bought only one copy. I needed one to keep and at least one to share. The title of this memoir might have been enough to drive me away if it hadn't been a book club choice. It does have the ring of a romance novel, doesn't it? But Jesuit priest, Father Greg Boyle's story of his work with gang members fascinated me. I loved learning about the practical ways, through his Homeboy Industries, he developed to help men and women leaving gangs or coming out of prison--jobs (which he sometimes helped fund), training, even tattoo-removal service when appropriate. Not all of his stories have happy endings. In fact, so many don't. He can help individuals leave the gang life, but he can't rid the area of gangs entirely, so many of his "homegirls" and "homeboys" still fall victim to gang violence. I most appreciated the way he helped me past external appearance to recognize each individual as God's creation, worthy of love and redemption. Boyle will be appearing in Nashville this month, and I've already made plans to be there. While I knew Lamott first through Bird by Bird, one of the best books on writing, I have discovered her quirky, unconventional books on faith just as engaging. I passed along her earlier book Help, Thanks, Wow (her three essential prayers) to so many people I care about. This particular book is her particular spin of the psalmist David's attitude of praise not only because of the blessings but in spite of whatever life throws at us. Since I'm not much of a television addict, I didn't really know much about Noah, so his memoir was a great introduction. Another book club selection, this one tells about his birth to a black mother and white father in South Africa when interracial relationships were illegal. I listened to the audiobook with the author reading, and it was excellent. I've read several books about South Africa before and after Apartheid, so I especially liked learning from one individual's perspective. Some of the incidents were amusing, while others were horrifying. Noah's relationship with his mother, a committed Christian, was poignant, especially when she is shot in the head by Trevor's step-father. One advantage to reading a memoir is knowing the author had to have survived to tell the story. I'm glad he did. I wrote about this tiny little book right after I read it, but it's one book I have recommended to readers and writers. I even chose this as my "Dirty Santa" gift at the Christmas party for English department employees and English majors. I love having a book of short pieces I can dip into (especially as a break when I'm reading one door-stop-weight book and listening to another. I wanted to read small segments out loud to friends, and I wanted to sit down quickly and write my own stories that resurfaced as I read. I have enjoyed McCann's novels, so I was tempted by this one, whose title he took from Rilke. Since I'd spent some time this summer working with some high school writers, I loved what he had to say. I also recognized that most of the advice is pertinent, regardless of one's age. It belongs on a writer's reference shelf. This true story of an American who grew an investment business in Russia, at great personal and financial risk, chilled me. I knew some of the incidents he relates from the news (including the poisoning death of a journalist associated with Browder), but the book delves so deeply into the corruption still going on. This book follows Vance's family, Kentucky natives who move back and forth between home and the "Rust Belt" for work. He gives insight into poor whites, often overlooked in fiction and nonfiction. Having taught in Western North Carolina when many displaced furniture workers were enrolled in the community college to retrain for new careers, I recognized so many of the situations Vance describes--the self-doubt, the self-fulfilling prophecies, the learned helplessness. He strongly conveys the power of family to overcome. I regularly need to dip back into the writings of Lewis, both his theology and his fiction. He approaches faith with logic and intellect. I've long been interested in his own life and his conversion to Christianity. I discovered William Nicholson's play Shadowlands, Lewis's love story and shared it with anyone who'd take the time to read it. The Hollywood movie was a disappointment, almost a parody of the play, but the BBC version holds up. I think Screwtape Letters or Surprised by Joy may make my 2018 reading list. This book didn't necessarily start slowly, but it was understated at first, as readers are introduced to Captain Jefferson Kidd in 1870. After his printing business failed, he spends his time going from town to town, reading aloud from a collection of newspapers from across the country and the world, changing twenty-five cents a head. He is asked to return a ten-year-old white girl to her surviving relatives after she has been held captive by Kiowa long enough to identify as a tribe member. I was drawn in quickly by the conflicts he and the girl face as she slowly learns to trust him and to communicate. When I hosted my book club to discuss this book, I had a playlist of fiddle tunes and other period music referenced in the book. I read and loved Towles' earlier novel Rules of Civility, even finding myself in D.C. at the National Museum with Walker Evans' subway portraits on display as I was just beginning to read the book in which they play a part. The storyline and characters of new novel are so different that I could forget they were written by the same author. When I read A Gentleman in Moscow, I couldn't wait to convince others to read it too. Count Alexander Rostov, the protagonist, is sentenced to house arrest in the Metropol Hotel because of some of his poetry deemed subversive. He is moved from his comfortable, even luxurious quarters to a small attic room. Over the years of the story, he encounters a number of characters who cross his path, in particular a young girl Nina who engages him in conversation and then exploration. He has a camaraderie with most of the employees of the hotel, but finds one particularly incompetent worker his nemesis. This book so charmed me that I still find myself remembering particular scenes. I've almost convinced myself that I've been to the Metropol myself. One of my best discoveries in the past couple of years was Penny's mystery series set in the fictional village of Three Pines. Usually I am reluctant to start a series, knowing the reading commitment; I don't gravitate toward mysteries either. But Penny's writing has captured me as one loyal reader. I always advise people to read her books in order, starting with Still Life. She gives enough exposition that any of the books can be read as a stand-alone, but reading in order feels like getting to know a whole community of real people. Inspector Gamache, the protagonist of the series, has taken on a new role in the law enforcement of Quebec and is coming under criticism for failure to deal with serious crime. The story involves his colleagues, including his son-in-law Jean Guy Beavoir, and the colorful locals I've come to love. Since I've read all thirteen books in the series, my wish for 2018 is that Penny is busily writing away on the next novel. This book also caught me by surprise. King took details of the life of Margaret Mead and transformed the characters, placing a married couple, both anthropologists, in New Guinea in the 1930s. The story is strong enough without a knowledge of the fact behind the fiction, something of a love triangle that develops in this rather competitive marriage and professional partnership. Nashville writer Jordan-Lake started this novel, set in Charleston both pre-Civil War during a failed slave rebellion and in 2012, several years ago. The modern protagonist takes a leave (practically going AWOL from her academic career) after the death of her parents, whose separation left her with unanswered questions. The back story, dealing with the plot of rebellion, follows a slave who words as a blacksmith, allowing him a small small amount of autonomy. Through the book, she moves back and forth between the two time settings, gradually weaving the stories together. She revealed at her book launch that current events forced her to rework the novel. The results make for good reading. I've always loved zoos, particularly the one in Birmingham where we often took our children when they were small. Even though Phillips never directly names the zoo at the center of her story, I know she hails from Alabama with her family in the area, so I take imaginative liberties. The story begins with a young mother and her son enjoying an outing. As they head toward the exit at closing time, though, they hear gunfire and are forced to take cover as a live shooter incident unfolds. I've read and enjoyed other novels by Philips, and I expect big things from this one. I understand a movie may be in the works. This book presents the story of Loo, a girl raised by her father who moves from place to place, keeping the girls' dead mother's mementos in something of a shrine. The twelve lives to which the title refers are the twelve bullet scars on Samuel's body. Several years ago, I enjoyed Alan Bennett's slender volume, An Uncommon Reader, in which Queen Elizabeth discovers the Bookmobile as she walks her corgis. This novel is a similar fiction treatment of the Queen's daily life, in this case as she begins to take a measure of her life. Kuhn introduces a number of characters, including an Indian teenager working at the cheese shop, the young woman who cares for the horses in the royal stables, and a number of palace employees. Kuhn builds tension, along with a measure of sympathy for the queen, as much she has taken for granted is being taken from her, all delivered with both humor and tenderness. I've been meaning to read this book for years. My husband read and loved it first and then accidentally left it on an airplane. I knew only that it was about music--piano music. One doesn't have to be musically knowledgeable or talented to enjoy this novel, but an interest makes the story so much more engaging. The main character, a young boy raised in a dysfunctional home by his single mother, discovers his own innate piano genius. A music store owner takes him under his wing and introduces him to teachers who can help him develop his unparalleled talent. I've read most of Lisa See's novels, and this one was especially enjoyable. The story begins in a remote area of China famous for its tea. As she does in many of her books, See explores how traditions have such a hold on people, particularly on daughters. The story also explores adoption of Chinese daughters by American parents. Reading the book was not only a character study but also "steeped me" (pardon the pun) in knowledge of the intricacies of the small family tea industry. I've been keeping a list of the books I read for years now. I have heard that Art Garfunkel has kept a similar list since he was sixteen, and I am envious that I didn't think to do this sooner. I record my finished books on my kitchen calendar and then transfer the list to my Book Woman notebook (and share here) at year's end. In the coming days, I want to give some "best of" details--novels, poetry, and nonfiction, but for now, I'll share my list. I hope some of my reading friends will reciprocate. Some of the books were unforgettable, while others like Chinese food didn't stick. I took the time to re-read a few I love, and I picked up a couple of older books I had been waiting to read, and I was so glad I did. Many of the choices were dictated by my book groups. As a result, I discovered some thought-provoking books I might have missed otherwise. As the year ended, I've been reading Walter Isaacson's biography Leonardo da Vinci with only about 400 page to go), and I'm listening to Ken Follett's Column of Fire, the third in the series that started many years ago with Pillars of the Earth, on my all-time favorites list. My to-read list is long, almost overwhelming, but I'm comforted to know I could be iced in and not lack for something good to read. May 2018 bring many good books your way.